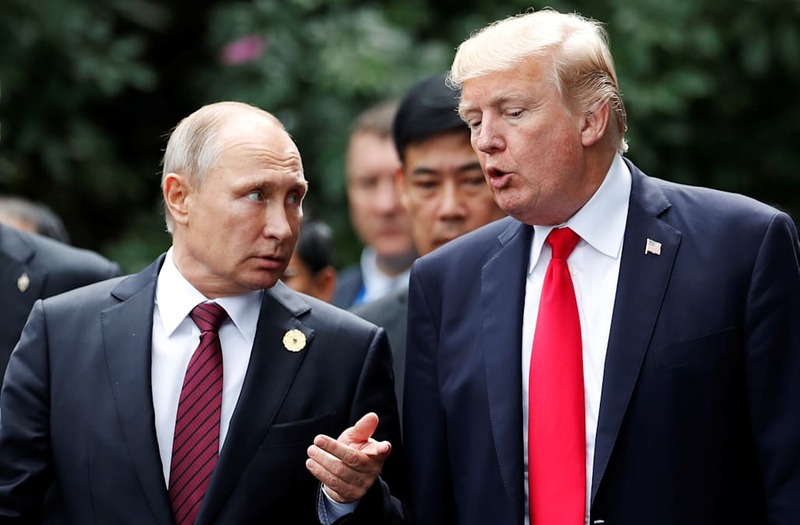 The US and Russia are currently in talks to arrange a summit between US President Donald Trump and Russian President Vladimir Putin. Experts say the US has nothing to gain and everything to lose from a meeting between Trump and Putin given current US-Russia relations and Trump's personal affinity for Putin. "But that seems to be the pattern of Trump's dealmaking," said one former State Department official. "We move the US embassy to Jerusalem and get nothing in exchange. We give the North Koreans a summit and get nothing in exchange. We pull out of the Iran nuclear deal and get nothing in exchange. This is par for the course." The White House and the Kremlin are in the early stages of arranging a summit between US President Donald Trump and Russian President Vladimir Putin, The Wall Street Journal reported late Friday. Citing people familiar with the matter, the report said the meeting's purpose would be to resolve longstanding differences between the US and Russia. The White House confirmed earlier this year that Trump invited Putin to Washington during a phone call the two men had in late March. News of a Trump-Putin meeting comes as the special counsel Robert Mueller's investigation into Russia's interference in the 2016 US election continues to gain steam. In addition to probing Russia's election meddling, Mueller is also examining whether members of the Trump campaign colluded with Moscow to tilt the election in his favor and whether Trump sought to obstruct justice when he found out about the investigation's existence last year. U.S. President Donald Trump and Russian President Vladimir Putin talk before a session of the APEC summit in Danang, Vietnam November 11, 2017. Sputnik/Mikhail Klimentyev/Kremlin via REUTERS ATTENTION EDITORS - THIS IMAGE WAS PROVIDED BY A THIRD PARTY. Russian President Vladimir Putin, U.S. President Donald Trump, Vietnamese President Tran Dai Quangand and Chinese President Xi Jinping arrive for the family photo session at the APEC Summit in Danang, Vietnam November 11, 2017. Sputnik/Mikhail Klimentyev/Kremlin via REUTERS ATTENTION EDITORS - THIS IMAGE WAS PROVIDED BY A THIRD PARTY. U.S. President Donald Trump and Russian President Vladimir Putin talk during a break in a session of the APEC summit in Danang, Vietnam November 11, 2017. Sputnik/Mikhail Klimentyev/Kremlin via REUTERS ATTENTION EDITORS - THIS IMAGE WAS PROVIDED BY A THIRD PARTY. Tensions between the US and Russia aren't limited to the domestic front. On a global scale, Russia is ramping up its aggression toward neighboring Ukraine, and it also continues to be a constant source of support for Syrian President Bashar al-Assad amid the Syrian Civil War. Meanwhile, Moscow is cultivating closer ties to Beijing in a move that experts say does not bode well for the US. And earlier this week, Russian foreign minister Sergey Lavrov visited North Korea and invited North Korean leader Kim Jong Un to Russia. Lavrov's visit came as the US and North Korea plan for a summit between the countries' leaders on June 12. "What was Lavrov even doing in Pyongyang? What other interest could they have there other than to undermine us?" said Richard Kauzlarich, a former deputy assistant secretary of state who is an expert on Russia policy. "Things are so far apart between the US and Russia right now that this meeting between Trump and Putin shouldn't even be happening in the first place. The US has nothing to gain here and everything to lose." Asked about the optics of a Trump-Putin summit amid Mueller's escalating probe and Russia's aggressive posturing on the global stage, one administration official told The Journal, "Of course there are discussions of the political perception." Complicating things further is the apparent juxtaposition between the Trump administration's tougher policy moves against Russia and Trump's personal affinity for the Russian leader. Mark Simakovsky, a former NATO chief of staff who advised the Department of Defense, emphasized the need for Trump to stay on the same page as his foreign-policy and national-security team to project a stronger stance to Russia. The way things currently stand, "there's no staying power to the US's moves," Simakovsky said, "so some of our allies and adversaries can say the US is not the global leader on these issues because we don't have a unified policy." To be sure, the White House has seen no shortage of public policy blunders when it comes to Russia. In April, for instance, Trump erupted after Nikki Haley, the US's ambassador to the United Nations, announced on television that the US would be imposing new sanctions against Russia for its role in a suspected chemical attack in Syria. Hours after Haley's comments, the White House abruptly reversed its position, blindsiding the UN ambassador. Earlier, when Haley went on television recently and criticized Russia over its aggression toward Ukraine, Trump reportedly yelled angrily, "Who wrote that for her?" South Carolina Gov. Nikki Haley, nominee to be the US ambassador to the United Nations, walks through the Capitol to the Senate subway on Thursday, Jan. 12, 2017. Former South Carolina Governor Nikki Haley testifies before a Senate Foreign Relations Committee confirmation hearing on her nomination to be to U.S. ambassador to the United Nations at Capitol Hill in Washington, U.S., January 18, 2017. Delegates pose for pictures with South Carolina Governor Nikki Haley (C) on the floor during the third session of the Republican National Convention in Cleveland, Ohio, U.S. July 20, 2016. U.S.Sen. Ted Cruz (R-TX) speaks with South Carolina Gov. Nikki Haley at the Federalist Society, 2016 National Lawyers Convention at the Mayflower Hotel, on November 18, 2016 in Washington, DC. Republican South Carolina Governor Nikki Haley delivers remarks at the Federalist Society 2016 National Lawyers Convention in Washington, U.S., November 18, 2016. South Carolina Governor Nikki Haley (L) and U.S. Republican presidential candidate Marco Rubio react on stage during a campaign event in Chapin, South Carolina February 17, 2016. Haley announced her endorsement of Rubio for the Republican presidential nomination. Escorted by staff and security, South Carolina Governor Nikki Haley (C) moves from one television interview to another across from the historic Emanuel African Methodist Episcopal Church June 19, 2015 in Charleston, South Carolina. Haley called for the death penalty for Dylann Storm Roof, 21, of Lexington, South Carolina, if he is found guilty of murdering nine people during a prayer meeting at the church Wednesday night. Among the dead is the Rev. Clementa Pinckney, the pastor of the church which, according to the National Park Service, is the oldest black congregation in America south of Baltimore. South Carolina Gov. Nikki Haley, right, greets U.S. Sen. Tim Scott, R-SC, at the first church service four days after a mass shooting that claimed the lives of nine people at the historic Emanuel African Methodist Church June 21, 2015 in Charleston, South Carolina. Chruch elders decided to hold the regularly scheduled Sunday school and worship service as they continue to grieve the shooting death of nine of its members including its pastor earlier this week. South Carolina Governor Nikki Haley speaks to press outside the Emanuel AME Church June 19, 2015 in Charleston, South Carolina.US police arrested a white high school dropout Thursday suspected of carrying out a gun massacre at one of America's oldest black churches, the latest deadly assault to fuel simmering racial tensions. Authorities detained 21-year-old Dylann Roof, shown wearing the flags of defunct white supremacist regimes in pictures taken from social media, after nine churchgoers were shot dead during a Bible study class on Wednesday evening. South Carolina Governor Nikki Haley holds a news conference with fellow members of the Republican Governors Association at the U.S. Chamber of Commerce February 23, 2015 in Washington, DC. Republican and Democratic governors met with U.S. President Barack Obama at the White House Monday during the last day of the National Governors Association winter meeting. South Carolina Gov. Nikki Haley waves on stage during the Republican National Convention at the Tampa Bay Times Forum on August 28, 2012 in Tampa, Florida. Today is the first full session of the RNC after the start was delayed due to Tropical Storm Isaac. Former Florida Governor and potential GOP presidential candidate Jeb Bush walks with South Carolina Governor Nikki Haley during a visit to Sistercare, a non-profit that aids domestic violence victims and their children on March 17, 2015 in Columbia, South Carolina. Bush announced in December that he 'actively explore' a presidential run in 2016. He is currently on a two day tour through South Carolina and will attend several fundraising events. Nikki Haley applauds the Claflin College Choir after their performance during her inauguration as governor of South Carolina, Wednesday, January 12, 2011, in Columbia, South Carolina. US Republican Governor of South Carolina Nikki Haley speaks at the Conservative Political Action Conference (CPAC) in National Harbor, Maryland, on March 15, 2013. Republican candidate for South Carolina Governor Nikki Haley (R) smiles along with her husband Michael Haley (L) and daughter Rena (C) as they watch the runoff election results at the Columbia Sheraton on June 22, 2010 in Columbia, South Carolina. Haley defeated Rep. Gresham Barrett in a runoff election. South Carolina Gov. Nikki Haley speaks to the media prior to the NASCAR Sprint Cup Series Bojangles' Southern 500 at Darlington Raceway on May 12, 2012 in Darlington, South Carolina. Republican presidential candidate, former Massachusetts Gov. Mitt Romney gives a birthday cake to South Carolina Gov. Nikki Haley during a campaign rally at Charleston Area Convention Center on January 20, 2012 in North Charleston, South Carolina. Romney continues to campaign for votes in South Carolina ahead of their primary on January 21. Nikki Haley speaks to supporters as she comes onto stage during an election party for Republican South Carolina Governor candidate Nikki Haley at the State Museum on June 22, 2010 in Columbia, South Carolina. Haley defeated Rep. Gresham Barrett in a runoff election. South Carolina State Rep. Nikki Haley from Lexington, pictured on May 14, 2009, is launching a bid to become South Carolina's first female governor. And last year, when Trump reluctantly approved the sale of US weapons to Ukraine, he warned aides and advisers not to publicly discuss the move. But in order for a Trump-Putin summit to play out in the US's favor, experts said Trump cannot afford to hold back when he meets face-to-face with the Russian leader. "If anything good is to come of a formal meeting between these two, Trump will have to reinforce the notion — eroded under his presidency — that the United States will not turn a blind eye to Moscow's malign influence around the globe," said Edward Price, who served as Senior Director of the National Security Council under President Barack Obama. He added that Trump will need to send a "forceful signal" that Moscow must change course as it relates to Ukraine, Syria, and its interference in the US election. "Anything less would be taken by Putin to be a green light." Kauzlarich, however, stressed that the fact that the White House is even planning for such a meeting works to Putin's advantage. "Putin already won," Kauzlarich said. "He's been seething over how he hasn't been able to establish a relationship with Trump. That this meeting is even being considered gives Putin everything and the US nothing." "But that seems to be the pattern of Trump's dealmaking," he added. "We move the US embassy to Jerusalem and get nothing in exchange. We give the North Koreans a summit and get nothing in exchange. We pull out of the Iran nuclear deal and get nothing in exchange. This is par for the course."